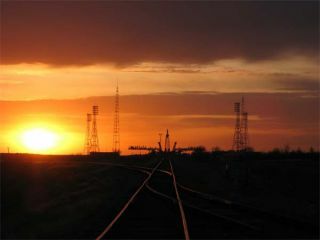 The launch pad at the Baikonur Cosmodrome in Kazakhstan is illuminated at sunrise as it awaits the arrival of the Soyuz TMA-18 vehicle March 31, 2010. The complex has received heightened security in the wake of recent terrorist bombings in Moscow. An air of heightened security has surrounded plans to launcha new crew of astronauts toward the International Space Station (ISS) aboard aRussian rocket early Friday. Two Russian cosmonauts and an American astronaut are slatedto lift off aboard a Soyuz TMA-18 spacecraft from Kazakhstan's BaikonurCosmodrome at 12:04 a.m. EDT (0404 GMT). In the wake of recentterrorist bombings in Moscow, the Russian government has increased securitymeasures at the launch site, including sniffer dogs and helicoptersurveillance, according to Russian wire reports. NASA astronaut Tracy Caldwell Dyson and Russian cosmonauts AlexanderSkvortsov and Mikhail Kornienko are due to take up long-term residence at thestation as Expedition23 flight engineers, bringing the station's crew complement to its maximumof six. They will join current ISS commander Oleg Kotov of Russia, as well asJapanese astronaut Soichi Noguchi and Timothy (T.J.) Creamer of NASA. The newcomers will have a busy first few weeks, with thespace shuttle Discoveryslated to launch on its STS-131 mission on April 5, only three days afterthe Soyuz launch, and arrive at the space station April 7 with its ownseven-member crew. "I imagine first off it?ll be get used to your newhome, and then it will be let?s get ready for the crew that?s coming up and allof the details that we?re going to need to provide and work with them to helpmake their mission a success," Dyson said in a preflight NASA interview. Dyson, a trained chemist, will be making her second trip tothe orbiting lab ? she previously visited in August 2007 aboard the spaceshuttle Endeavour's STS-118 flight. A native of Arcadia,Calif., she was selected as an astronaut in June 1998. Dyson's scientific background will be useful for the busyschedule of research activities she plans while in space. "The science that we?re doing on spacestation isn?t just fun science, it?s not gee whiz; it?s science with apurpose," she said. "It?s a purpose of going on and exploring spaceand as well as what can we understand better about our own life here onEarth." Alexander Skvortsov of Russia will be making his firstspaceflight. A Russian Air Force pilot and an experienced diver, Skvortsov wasselected as a cosmonaut candidate in 1997. "This has always been my dream, to fly, because myfirst desire was to fly in the air," he said in a preflight interview. Skvortsov'sfather was an aviator and was a member of the cosmonaut corps for a short timebut never flew for health reasons. "The idea of space has always been verystrongly present in our family." In addition to the regular station maintenance duties, Skvortsovsaid he is looking forward to his research activities. "I think one of the most important tasks that our crewmembers will have is promoting scientific research in space, a humanspaceflight program, because I believe that humanity as a whole should striveto achieve loftier goals and try to expand the horizons," he said. Skvortsov will command the TMA-18 flight, and is due to takeover the helm of the space station in May as Expedition 24 commander. Another cosmonaut, Mikhail Kornienko, will also be makinghis first spaceflight. "It?s very important for me to see the Earth from afarand to spend six months on the station and try myself in the work on thestation," Kornienko said. "I?m really looking forward to it." Kornienko is a former Russian military paratrooper, andworked as an engineer for the main Russian space agency contractor, EnergiaRocket Space Corporation (RSC), before being selected as a cosmonaut candidatein 1998.
? "The road to the space station for me was filled withobstacles and hard work, but I?m here," he said. The spaceflyers are due to dock at the space station April4.